Confronting complex situations is the hallmark of strategic decision-making. While these situations may be perceived as equivocal, organizations must cope, act, and thrive within such ambiguities. This study explores the manifestation and regulation of equivocality during strategic marketing decision-making. 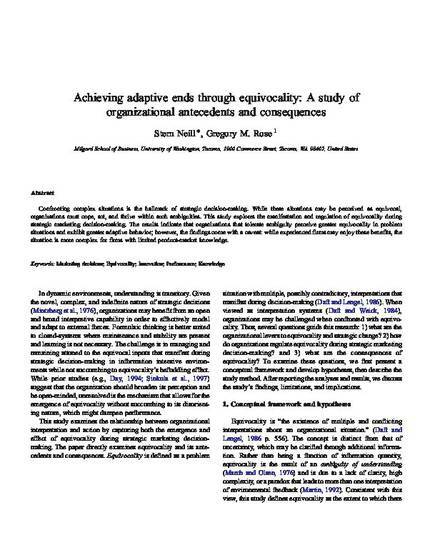 The results indicate that organizations that tolerate ambiguity perceive greater equivocality in problem situations and exhibit greater adaptive behavior; however, the findings come with a caveat: while experienced firms may enjoy these benefits, the situation is more complex for firms with limited product-market knowledge.